It gives me great pleasure to visit King’s College London. I wish to begin by warmly congratulating you on the official launch of the China Institute. The reputation of King’s College has been built on your long history and academic excellence, which has resulted in you becoming a magnet for students from around the world. And you must be proud to have produced so many influential and outstanding graduates in the sciences, literature and politics, Who have made significant contributions in their respective fields, not only in Britain but across the world. With many of them becoming household names in China. 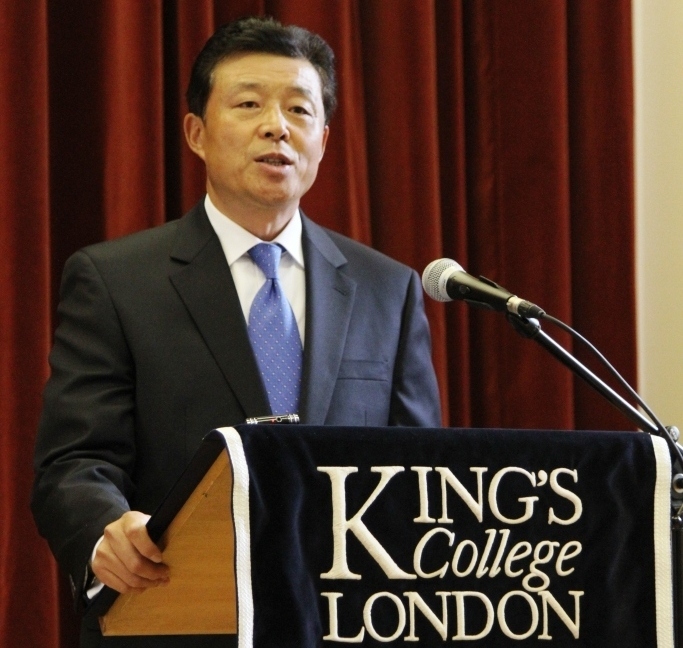 I am delighted to know that King’s College London has developed such close links with the Renmin University and other Chinese universities. In addition to the 340 Chinese students you have studying here for their bachelors’ and masters’ degrees. 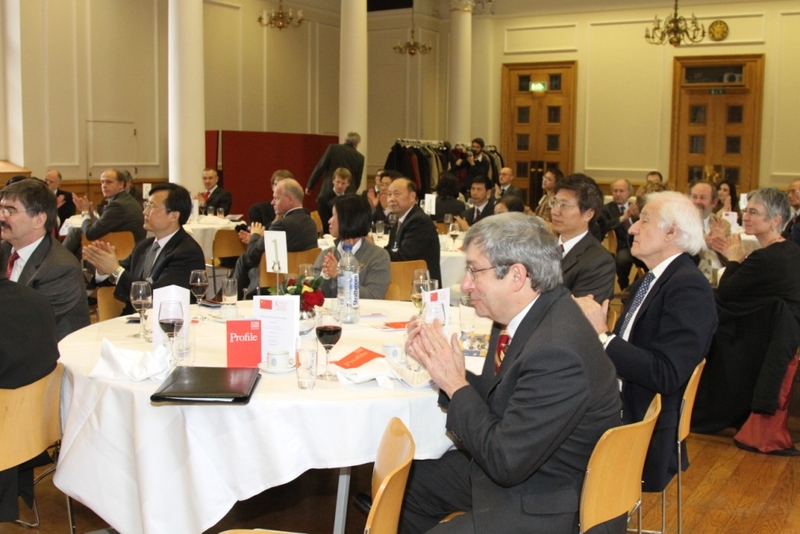 Today the official launch of the China Institute will raise China-related research at King’s College to a new level. I hope this will also contribute to China studies in Britain as a whole. Professor Trainor talked about the sinologist Sir John Staunton, who established the first Professorial Chair in Chinese at King’s College London in the 1840s. Back in the late 18th century Sir John’s grandfather, Sir George Staunton was named Secretary to the MaCartney Mission to China and authored An Authentic Account of an Embassy from the King of Great Britain to the Emperor of China. The MaCartney Mission was the first official contact between China and Britain. Unfortunately it was far from being a success, which was described in history books as a conversation “between the deaf and the blind”. It showed a serious lack of mutual understanding and a huge cultural gap. Today, more and more people in Britain are keen to learn about China, which is very encouraging. As people need to know more about each other before making friends. In my view, academic institutions and China experts in Britain should not only pursue their academic studies. But should also reach out to the general public and help them understand today’s China. This will be conducive in promoting the friendship between our two peoples and strengthening popular support for the China-UK relations. I do hope the China Institute will play a leading role in this regard. A short while ago, I attended the unveiling of the statue of Confucius. It was both pleasing and touching to see the statue of the great philosopher, statesman and educator standing in the campus of King’s College, thousands of miles away from China. Confucius, even 2,000 years after his passing, remains a source of wisdom and inspiration. Ralph Waldo Emerson, the American poet and philosopher once remarked that Confucius brings glory to every nation in the world. Today, Confucius Institutes have been established in 88 countries and regions to promote the Chinese language and mutual understanding. The UK alone is home to 12 Confucius Institutes and now 54 Confucius Classrooms. As I had the pleasure of attending the launch ceremony of the 54th Classroom just yesterday. I hope that the statute of Confucius will not only serve as a symbol of friendship between King’s College and China. But also encourages more students here to learn about Confucian thinking and Chinese culture as they get to know more about China’s past and present. Confucius said “peace is precious” and one should pursue “harmony without uniformity”. It is important for countries, no matter how different they are and whatever civilisations they have inherited, to forge relationships based on mutual respect and understanding. Only in this way, and by drawing on each other’s strong points to make up for deficiencies, can our world be a more peaceful, more harmonious and better place for all. 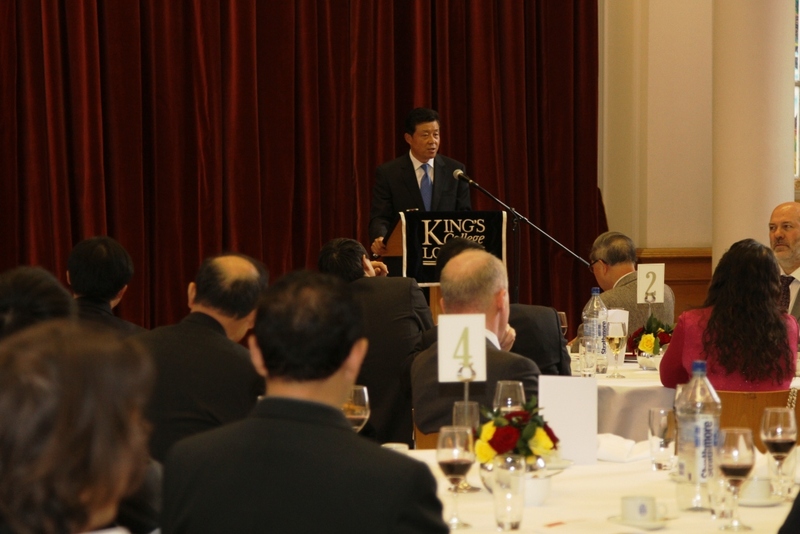 In conclusion, I hope that King’s College London will take today’s launch as a golden opportunity to pursue closer exchanges and cooperation with China, and make greater contribution to the mutual understanding and friendship between our two peoples.